I am no doubt one of many frustrated anime fans. You see, I love the genre, and I am very enamored with many of the programs, including Fushigi Yugi, The Slayers, and Cowboy Bebop. Unfortunately, these never have (and never will) air on American TV, so the only way to see them is on video or DVD. And even more unfortunately, it soon becomes very, very costly to collect even a single series, let alone several favorites. One wishing to collect an entire run of a show (usually about 26 episodes) should be prepared to spend at least $240 retail. These costs are staggering enough to the die-hard otaku, but most casual fans of anime would never dream of dropping that much on a series that they likely won't have seen all the way through until they have laid down the big bucks. So that means you must be discriminating in your anime purchasing habits, right? Well, than a good place to start would be with what many consider one of the greatest anime series of all time: Neon Genesis Evangelion. The show originally aired in 1995 and immediately drew critical raves and high ratings. Several years later, the VHS releases from ADV were also a big success. Finally, in late 2000, ADV cleared up some rights issues and began releasing the series on DVD here in the states. The wait was well worth it, if only to have this brilliant masterpiece on a more permanent format. It is difficult to jump into this review without a brief summary of the previous three volumes in the series. The year is 2015, and Earth is recovering from First Impact, a disaster that occurred 15 years earlier, which left half of its population dead. Humanity's newfound peace does not last, however, as mysterious and destructive beings begin visiting the Earth. These are the Angels. No one knows what they are or where they come from. The only defense against these invaders are the Evangelions, giant robotic creations which can only be piloted by 14-year-old children born after the First Impact; and the organization that operates them, NERV. The three chosen children are Rei, Shinji, and Asuka. If you haven't seen this series before, don't let the premise fool you. While it sounds clichéd and uninspired at first glance, it is actually a twisted, compelling narrative worthy of The X-Files. Anyway, the real focus here isn't on the giant robot battles (which admittedly are very cool). The real focus is on characterization, mainly on Shinji and his feelings of inadequacy and exclusion from the human race.There is also a lot of development of the background characters, especially Asuka, Rei, and two women who deal with the Evangelion project, Misato and Ritsuko. Three episodes are included on this discs, 12-14 in a series of 26. 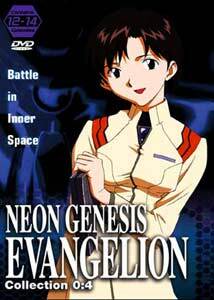 Up to this point in the series, Evangelion had been a very good, but fairly straightforward, anime show. Excellent characters and animation, but nothing outstanding. However, it is with this episode that the more reflective, emotional aspects of the plot begin to emerge. Misato receives a promotion, and it sparks an introspective review of what led her to work at NERV. Both she and Shinji grapple with their relationships with their fathers. Meanwhile, a new Angel has invaded, this one worse than all before it, and it will take the combined strength of Shinji, Rei, and Asuka and all three Eva units to defeat it. Not a whole lot happens in this episode, but there are a lot of nice character moments with Shinji and Misato, and both of their characters are expanded nicely. In the middle of a test on the Eva units, alarms sound throughout NERV headquarters. An Angel has invaded a biomechanical life form that is reprogramming the computer systems. The target is unclear, but it is up to Ritsuko to stop it. After all, it was her mother who programmed the computer systems. This is my favorite episode on this disc, and one of my favorites in the series. I don't want to give away too much about what exactly goes on with Ritsuko and the computer systems, but let me say that it makes a character that was previously bossy and annoying very sympathetic. This episode marks another evolution for the series, as the conspiracy that has been lurking for 13 episodes is finally—partially—revealed. It seems that the organization that oversees NERV, SELEE, is none-too-happy with Ghendo Ikari, Shinji's father and the head of NERV operation. It seems that an Angel invasion into the heart of NERV wasn't exactly on the timetables... the question is, what IS? This episode does a good job of answering some questions without really answering anything, but it is probably the weakest on the disc because the first half is merely a "When Angels Attack" (or maybe, "World's Scariest Angel Invasions") style summary of the first 12 Angels (and episodes). Of course, once the SELEE guys show their faces, things pick up, and the ending is a real shocker that left me, upon first viewing, racing to the store to purchase the next video. This is a fine collection of episodes from one of the best anime series ever. The animation suffers a bit in the dialogue scenes from budgetary concerns (this was, after all, just a TV series in Japan), but the storytelling and action sequences more than make up for it. Buy Evangelion 0:4 ASAP, but make sure you purchase and watch the first three collections beforehand. Trust me, you'll be glad you did. Image Transfer Review: Picture quality on this disc is a bit problematic, but it still looks far better than my VHS copies. Colors are a bit washed out, but they are nice and solid with no blooming or bleeding. There is a bit more edge enhancement than I'd like, but overall, it isn't really a distracting problem. I noticed no digital artifacts, and black level is generally very good. Unfortunately, here and there the picture seems to jump in the frame a bit. I'm not sure if this is because of the transfer or the source materials, but it is only a problem in one or two scenes. Audio Transfer Review: This is a good audio mix of the original TV materials. Dialogue is always clear and understandable. The mains spread out the score and sound effects, and there are some nice panning and directional effects during the action scenes. Extras Review: Extras are unfortunately fairly sparse on this release. All we get is a 10-minute reel of ADV previews all edited together. Aside from that, all that is included are some brief character bios. Of course, you could count the inclusion of both the dubbed English and subtitled Japanese tracks as a bonus, but I tend to think that should be the standard for anime releases. Neon Genesis Evangelion is perhaps one of the greatest anime series of all time. If you have only experienced American animation, this series is an excellent introduction into the world of grown-up "cartoons." This disc offers up three compelling episodes, but to really appreciate the stories and character growth, you need to start from the beginning.